Sometimes I take such pleasure in savouring the beauty of individual, fresh ingredients, that I almost feel sorry to cook them, no matter how delicious the results. Such was the case this weekend when I bought myself a weighty fresh char fish from my local fishmongers. It’s so much nicer to buy fish straight from an authentic fishmongers rather than all wrapped in cellophane from the supermarket – and all the more so when you live in the city, as we do. As soon as I got home, I couldn’t wait to unwrap my fish and then, placing it amongst the fresh herbs and lemon and fennel and seasonal Jersey Royal potatoes with which I planned to cook her, I stared in wonder at the beauty of nature’s incredible creation. Having the opportunity to look at a fish close up, to feel her snake like curving spine beneath her fine muscular flesh, examining her tight little silvery scales and her bewildering staring eye, with a black hole disappearing apparently into the beyond, I was completely captivated. Almost sadistically, I took great pleasure in opening up her mouth and checking out what looks like a meaty little tongue – who knew that fish even have tongues(!) – and revelled in the aesthetic glory of this new occupant of my kitchen. And of course, inevitably, not long behind came my camera, and the opportunity to capture this beautiful fish “on film”. 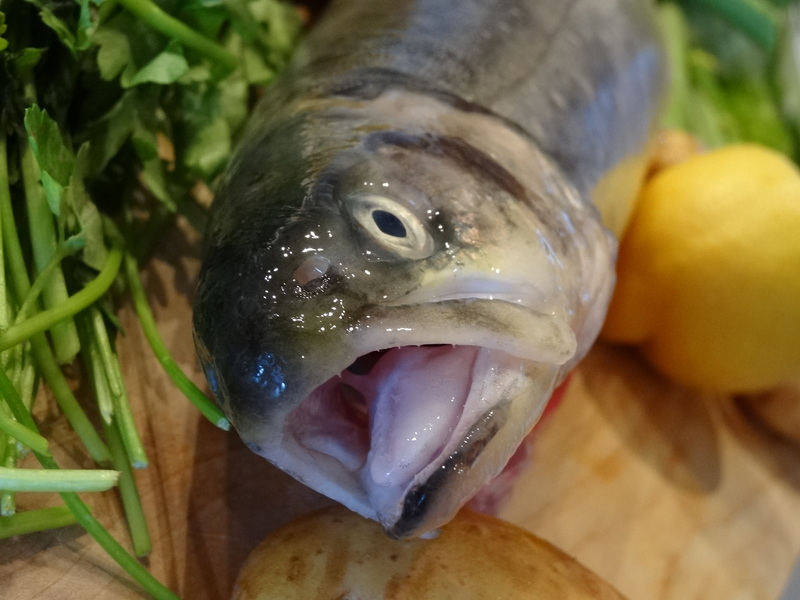 So for this week’s photo of the week, I could not resist sharing one of these shots with you when, with Florence the Fish’s mouth wide open, she looks almost ready to pounce from amongst her new found ocean of earthy potatoes and fresh verdant parsley. Sadly this was not to be, as Florence was destined to end up en papillote, and cooked, quite simply to perfection. She will, I’m sure, be proud to know at least that in her sad demise, she made for one hell of a delicious meal. All photos and written content are strictly the copyright of Nicholas de Lacy-Brown © 2013 and The Daily Norm. All rights are reserved.